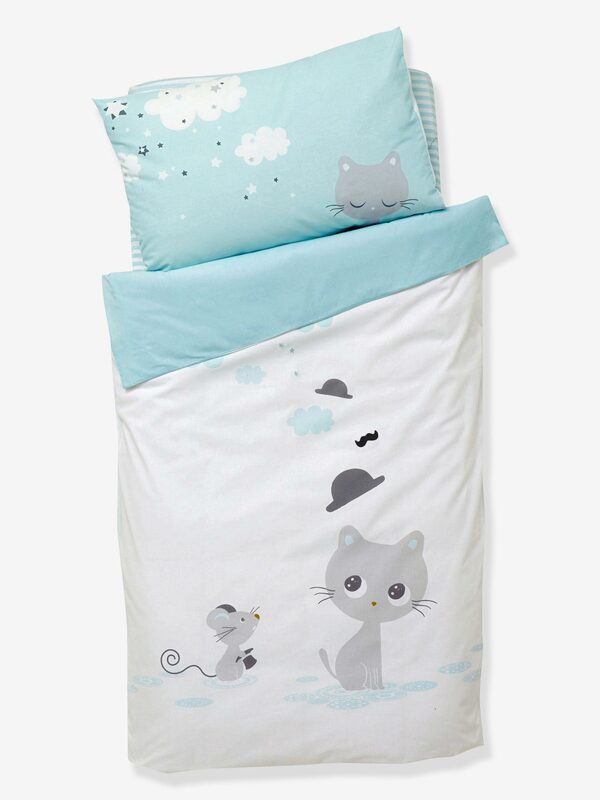 Featuring an exclusive motif where the tiny little mouse stands up to the big bad kitty cat! We love this high quality bed linen especially for your baby. SIZES: 80 x 120 cm and 100 x 120 cm. One side with cat and mouse print, bowler hats, whiskers, clouds and little stars, one side plain sky blue. Excellent colourfastness after repeated washing. Bed size 60 x 120 cm: choose duvet cover 80 x 120 cm. Bed size 70 x 140 cm: choose duvet cover 100 x 120 cm. Team with the matching pillowcases and fitted sheets available on the website. High quality 100% woven cotton (57 threads/cm2).